There are lots of spooktacular events happening in Manchester over the half term – mainly at the LEGOLAND Discovery and SEA LIFE centres based at Barton Square at the Trafford Centre. We managed to have a sneak preview last weekend of what visitors to the centres can expect, be prepared for lots of thrills and treats! We had lots of fun taking part in the Halloween activities – definitely worth a trip to the centres over half term! The Halloween events at both centres run until 1st November 2015. LEGOLAND Discovery Centre are hosting a ‘Brick or Treat’ event in the run up to Halloween with free entry* for little visitors who dress up in fancy dress on Saturday October 31st. On arrival, you’ll be given a special Halloween Hunt card that needs to be completed during the journey around the attraction. 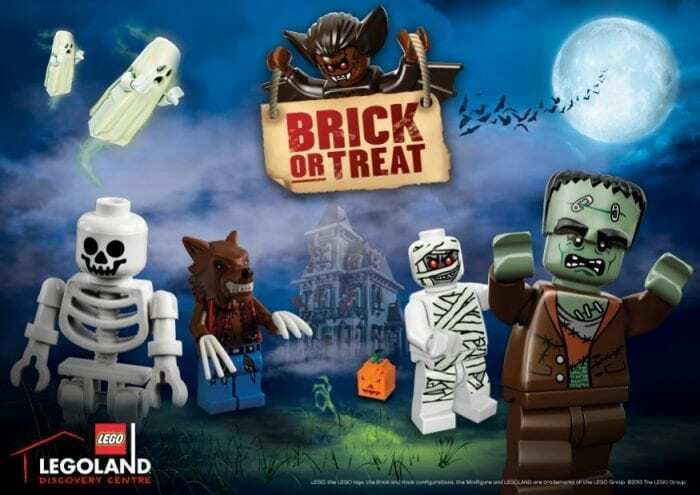 Visitors will come nose-to-brick with not one but three giant spooktacular castles, which have been built by the resident Master Model Builder and his Creative Crew, but be warned, they’re each haunted by LEGO® zombies, ghosts and skeletons. Visitors will also be able to build a special LEGO pumpkin in the designated Halloween building area. As an extra treat visitors are invited to get hands on and help to theme the spooky LEGO® ghost train that will be chugging its way past the haunted castles. At the SEA LIFE Centre next door to the LEGOLAND Discovery Centre, all is not what it seems under the dark, mysterious waters of the oceans and during the attraction’s festive Spooky Seas event, visitors will learn that some of the scariest looking creatures are actually some of the most sensitive in the ocean. Visitors will be given a Pumpkin Hunt card on arrival – look out for the letters carved into the submerged pumpkins on your way around the centre and don’t forgot to pop by and see Ernie the very cute sea turtle! There will be lots of fishy fun too of course, including a novel pumpkin hunt, a Yucky Dip, spooky fact finding, paper lantern making, crafts and even fancy dress! You can purchase tickets on the door, but check out the respective SEA LIFE Centre and LEGOLAND Discovery Centre sites to book tickets online! *Free entry for children aged 11 years and under, who are in Halloween fancy dress and are accompanied by a full paying adult. Wish I had seen this earlier this week I never thought about the Discovery Centre and the drive might be a bit much tomorrow with us doing Widnsor for the weekend. Sounds like a great event.